I made chown and chmod to var, lib, and data/db and log mongodb. Not sure what else to do. Any suggestions? Thu Oct 11 08:29:40 warning: 32-bit servers don't have journaling enabled by default. Please use --journal if you want durability. Thu Oct 11 08:29:41 [initandlisten] Unable to check for journal files due to: boost::filesystem::basic_directory_iterator constructor: No such file or directory: "/var/lib/mongodb/journal"
Thu Oct 11 12:05:42 warning: 32-bit servers don't have journaling enabled by default. Please use --journal if you want durability. Thu Oct 11 12:05:42 [initandlisten] Unable to check for journal files due to: boost::filesystem::basic_directory_iterator constructor: No such file or directory: "/data/db/journal"
But still having the same problem. The log indicates that mongodb is terminating because there is an old lock file. If you are not and were not running with journaling, remove the lock file, run repair, and start mongodb again. If you are or were running with journaling turned on, see the relevant Mongo DB docs. Note that they say "If you are running with Journaling you should not do a repair to recover to a consistent state." So if you were journaling, the repair may have made things worse. Step 1: Remove lock file. Step 4: Check status of mongodb. Step 5: Start mongo console. Did you run mongod before running mongo? 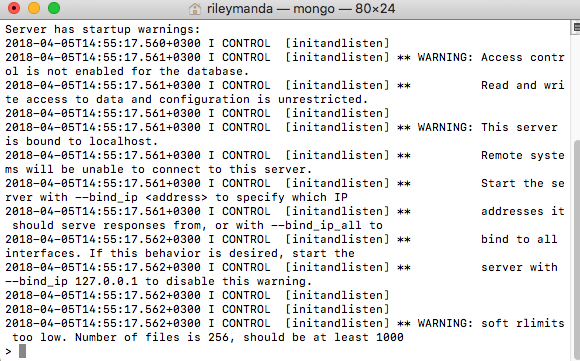 I followed installation instructions for mongodb from http://docs.mongodb.org/manual/tutorial/install-mongodb-on-os-x/ and I had the same error as you only when I ran mongo before actually running the mongo process with mongod. I thought installing mongodb would also launch it but you need to launch it manually with mongod before you do anything else that needs mongodb. Check your filesystem free space and increase it if its less. This also could cause the mongo not to start. Check the /var/log/mongodb/mongodb.log file. 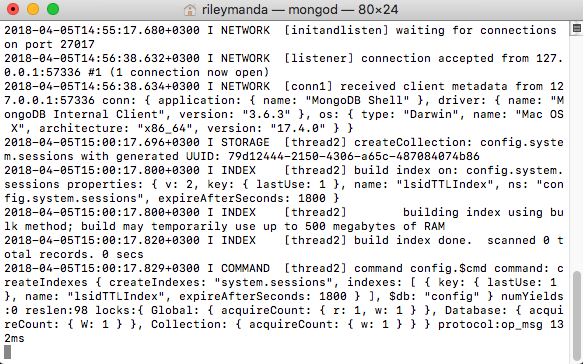 Try running mongod before mongo. You can check with netstat -anp | grep 27017 to see if the port is in use by another process. Now open two terminals.One will for your mondo daemon the other for your mongo. Finally always keep in mind that you have to run mondod before you run mongo on your terminals. I followed the doc at http://docs.mongodb.org/manual/tutorial/install-mongodb-on-red-hat/. After configured and reboot, I executed sudo service mongod start and got ... [FAILED]. At last, I found that mongod had started. I think the yum install added it to auto start. To check if your mongod is running: service mongod status . Hope this can help someone has same problem. Don't forget to restart mongodb service if you changed the config. I have mongo version 3.2.1 and had to delete the lock file from /data/db/ and after this, ran mongod and it started successfully. After removing mongod.lock which was inside the data directory in my windows OS,it was still showing the same error message. I had to run mongod with --dbpath to make the mongo command run without errors. Although the answers are received, I would wish to discuss about network errors in MongoDB. Setting the safe write concerns is not the full proof method to make sure that we're safe. Let's assume that w=1 & j=true are set, what if the write acknowledgement didn't received from the server? Well, the likelyhood is it didn't happened, but it might have happened. The reason why this might have happened is that there are network errors - there are reasons that we may not receive an affirmative response. So, we can send the request from the application through a driver of language of choice. mongod can complete it successfully and then there could be a TCP reset, and the network actually can get reset in a way that we never receive response. So, we could get an error and on the error, we might assume that we got an error. It didn't happened, but it may happen. For an insert, it's possible to guard against it. It's possible because if we let the driver create the _id and we do an insert - then we could do that insert multiple times and it would be any harm. Because, if we do this 1st time and we get an error and we're not sure whether or not that insert completed because it's a network error, then we could just do it again. And provided we perform it again, tyr to perform it with the exact _id. The worst case scenario is we'll get a duplicate key error when we try to insert it. However, an update is where the problem occurs. Especially, the update which is not item potent, that for instance included a $ink command. So, we're telling the database to increment a certain field. Well in that case, if we get a network error and we don't know whether or not the update occurred. Now, maybe we know enough about the values that we can check with them that the update occurred, which is fine. But if we don't know the starting value in the database for that field, then it's not possible for us to know whether or not it occurred or not in case of network error. This kind of issues are extremely rare with a fine network. And if we really need to avoid it at all costs, what we need to do is turn on all our updates into inserts, by reading the full value of the document out of the database and then potentially deleting it and inserting it again or just inserting a new one. The network TCP connection between the application and the server was reset after the server received a write but before a response could be sent. The MongoDB server terminates between receiving the write and responding to it. The network fails between the time of the write and the time the client receives a response to the write. Adding the bin to PATH in Environment Variables helped. now type "mongo" in cmd in the respective path where the mongo.exe is present, it will start working. How to connect to MongoDB in Windows? Why MongoDB is only connecting to: test schema?